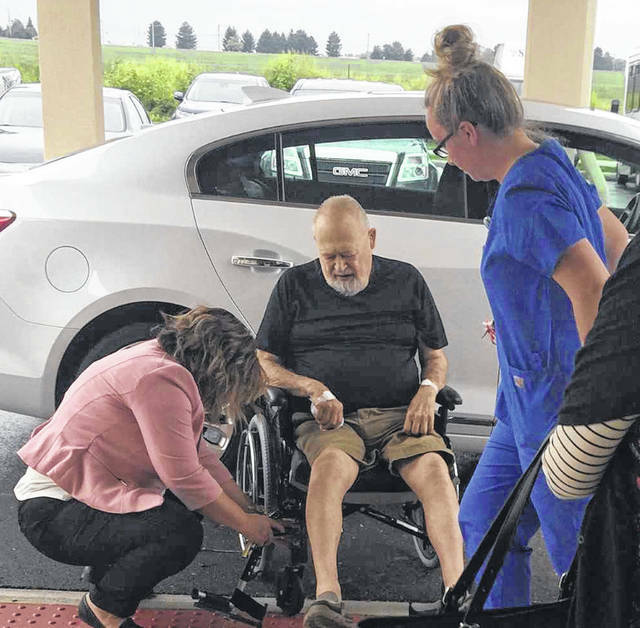 TCU Nurse Manager Darlene Swords, left, and TCU Nurse Shelby Landers, right, assist patient Robert Deeter, center, as he enters the SpringMeade Health Center in Tipp City recently. Deeter was the first patient to be admitted to the recently expanded Transitional Care Unit. TIPP CITY — Premier Health/Upper Valley Medical Center’s SpringMeade Health Center in Tipp City welcomed its first patient through the doors of the newly expanded Transitional Care Unit this week. Robert Deeter, 76, of Lakeview, was greeted by SpringMeade’s leadership team, including Kristy Earick, administrator, Dana Weatherspoon, director of nursing, Darlene Swords, TCU nurse manager, Robin Shafer, director of admissions, Kim Butcher, RN, regional clinical director for AdCare Health Systems, Inc., which manages SpringMeade Health Center, as well as numerous SpringMeade staff members. He was clapped in and welcomed with a balloon bouquet. “Mr. Deeter was the perfect short-term rehab patient for us to open the doors to welcome and accept from UVMC,” Earick said. Deeter was ready to be discharged from the hospital and in need of additional rehabilitation prior to returning to home. We offer extensive therapy up to seven days a week,” she added. SpringMeade Health Center is a vital resource in the community as a step between the full services of a hospital and the independence of home, and is unique in the community in that it is the only skilled nursing and rehabilitation center in Miami County to be led by a Rehabilitation Medical Director, Dr. Rebecca Hayworth. Dr. Hayworth is a physiatrist who practices in Troy with her father, Dr. James Hoover, at Rehab Med H and H. She also sees patients in the inpatient rehab unit at UVMC. According to Earick, SpringMeade recently received the license from the Ohio Department of Health and have now officially opened the doors to welcome and accept patients to the expanded TCU. The expansion includes approximately 12,000 square feet of new construction on the north side of the facility to house 15 private suites, therapy gym, dining room, and common space with a private entrance on the facility’s north end. One of the rehab suites will be equipped for bariatric patients. “The new rooms are beautiful, private suites with showers and other amenities. We know this is important to our rehab patients who have told us with increasing frequency they want a private room,” Earick said. The expansion increases SpringMeade Health Center’s total number of beds from 99 to 114, with 43 dedicated to short-term rehab patients, 49 dedicated to long-term care, and 22 for secured memory care. In addition to short-term rehab and long-term care, SpringMeade offers respite and hospice care. SpringMeade Health Center, located just off Interstate 75 in Tipp City, is a nursing and rehabilitation center that is rated a Five-Star Quality Measures Facility by the Centers for Medicare and Medicaid Services. “Utilizing a patient-centric approach, our highly trained physicians, nurses, and therapists coordinate to deliver the highest quality of care as evidenced by our CMS Quality Measure and Five-Star performance,” Earick said. Opened by UVMC in 1992, SpringMeade Health Center was built on a prominent farm that had been known as “Mon Reposo” – my place of rest. A long tree-lined drive on the farm led to a stately main house that dates back to 1866. The farmhouse, which was expanded in 1997, now serves as the activities center and popular gathering place for the SpringMeade complex. The complex also includes 85 independent residential coach homes and a new residential care facility. To learn more about SpringMeade, please call (937) 667-7500 or visit springmeadehealthcenter.com.